Increased demand on HMA pavements. Traffic volume, loads and tire pressures have increased substantially in recent years, which can cause increased rutting and cracking. Many modifiers can improve the asphalt binder’s stiffness at normal service temperatures to increase rut resistance, while decreasing its stiffness at low temperatures to improve its resistance to thermal cracking. Superpave asphalt binder specifications. Superpave asphalt binder specifications developed in the 1990s require asphalt binders to meet stiffness requirements at both high and low temperatures. In regions with extreme climatic conditions this is not possible without asphalt binder modification. Environmental and economic issues. It is both environmentally and economically sound to recycle waste and industrial byproducts (such as tires, roofing shingles, glass and ash) in order to gain added benefit. Thus, when they can benefit the final product without creating an environmental liability they are often used as additives in HMA. Public agency willingness to fund higher-cost asphalt additives. Modified asphalt cement is usually higher in initial cost than unmodified asphalt cement, but it should provide a longer service life with less maintenance. Lower stiffness (or viscosity) at the high temperatures associated with construction. This facilitates pumping of the liquid asphalt binder as well as mixing and compaction of HMA. Higher stiffness at high service temperatures. This will reduce rutting and shoving. Lower stiffness and faster relaxation properties at low service temperatures. This will reduce thermal cracking. Increased adhesion between the asphalt binder and the aggregate in the presence of moisture. This will reduce the likelihood of stripping. 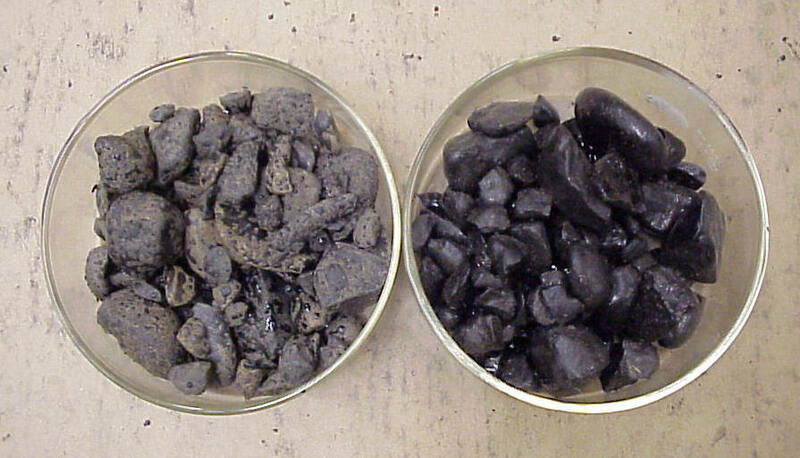 Figure 1 shows two aggregate samples from the same source after they have been coated with asphalt binder. The asphalt binder used with the sample on the left contain no anti-stripping modifier, which resulted in almost no aggregate-asphalt binder adhesion. The asphalt binder used with the sample on the right contains 0.5% (by weight of asphalt binder) of an anti-stripping modifier, which results in good aggregate-asphalt binder adhesion. Figure 1. Anti-stripping modifier example. Figure 2. Effect of polymer modifiers on asphalt binder viscosity (after Epps, 2002).